If you can clear a room just by taking off your shoes, it’s high time you took note of the problem. While this issue frequently rears its ugly head in the summer, some unfortunate souls have to contend with it year-round and summers only worsen the situation, making the state of affairs deplorable to say the least. Sweat and bacteria are the root cause of bad foot odor. While sweat from your feet in itself is not odorous, the naturally present bacteria feed on that sweat, producing foul-smelling by-products. Your feet have about ½ million sweat glands, which produce a lot of sweat. When your feet stay cloaked in shoes for long periods of time, the warm, dark and moist environment becomes a haven for the bacteria to multiply and feed. Teenagers and pregnant women are more susceptible to having odorous feet due to their hormonal imbalance, which leads to pronounced sweating. However, an unbearably foul stench emanating from your feet could indicate an underlying medical condition, especially in diabetic patients. In the latter case, one should rule out other probable causes of foot odor before consulting your doctor. A solution always starts with identifying the problem and its causes. With some simple and practical guidelines, you can easily keep the foul smell on your feet at bay. 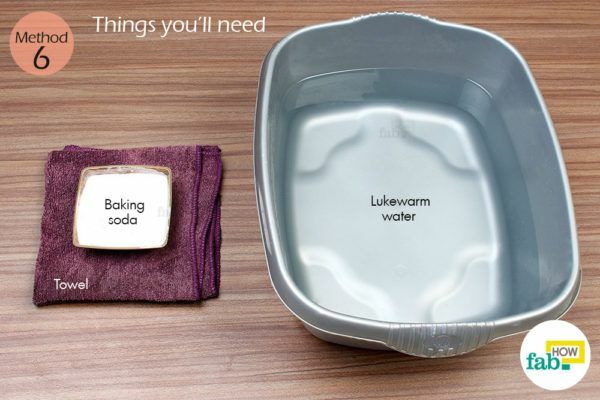 Fill a tub halfway with lukewarm water. The tub should be large enough to accommodate your feet comfortably. Check the temperature of the water with your hands to ensure that it is comfortable to your skin. Add 2 tablespoons of Epsom salt to it. 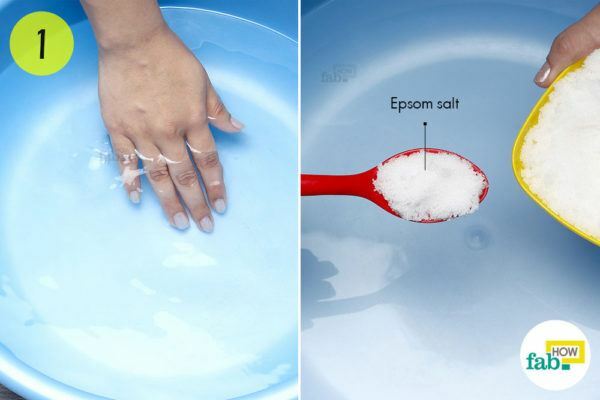 Dissolve the Epsom salt completely in the water. Epsom salt is a champion in neutralizing foot odor. 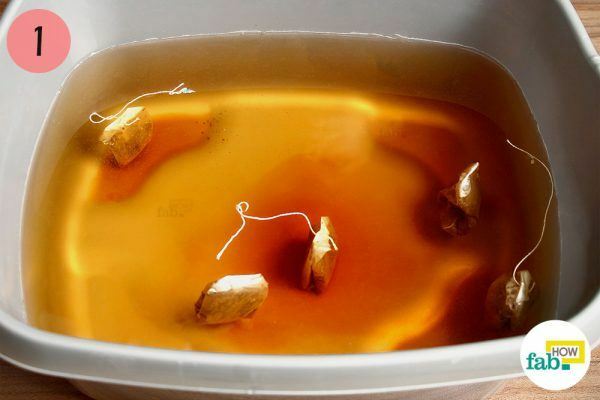 It also possesses detoxifying properties and is considered to be a good home remedy for achy feet. In short, Epsom salt is an all-in-one tonic for your feet. Soak your feet in the foot bath for 10 to 15 minutes for optimum results. After the foot soak, wipe your feet completely with a dry towel. Be sure to dry the area between your toes. This area, if left dampened, can easily become a breeding ground for bacteria. 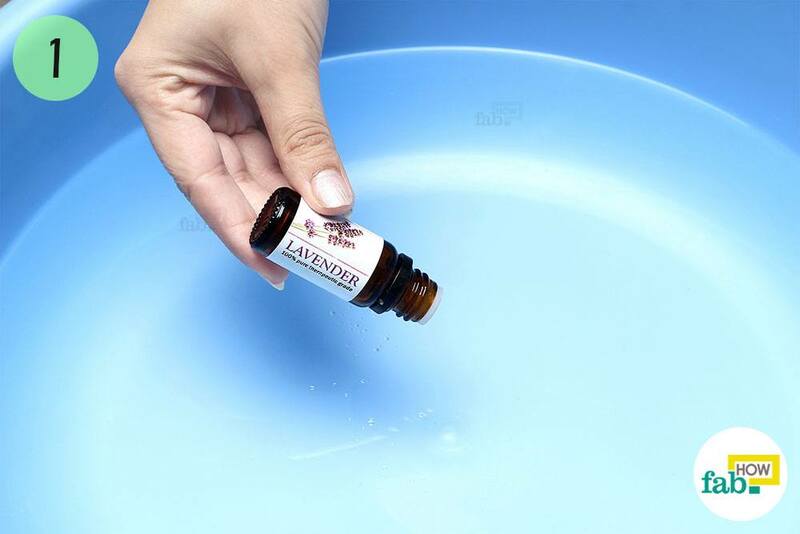 Besides giving out a pleasing aroma, lavender essential oil possesses antimicrobial properties that are beneficial against the odor-causing bacteria. Fill a tub halfway with lukewarm water and put 2 or 3 drops of lavender essential oil in it. 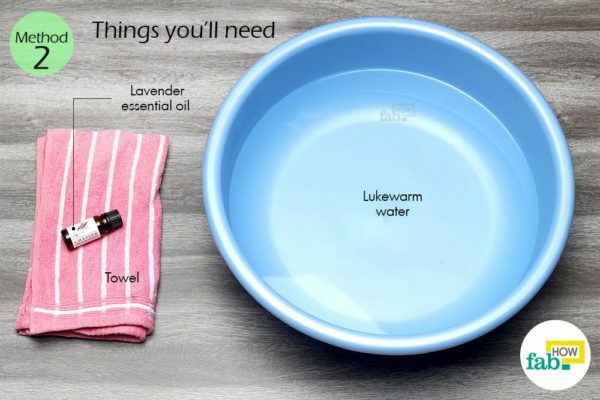 Essential oils are very potent, so a few drops is enough to obtain a beneficial foot bath. Tea tree essential oil is a good alternative for this procedure. Soak your feet in the lavender foot bath for 10 to 20 minutes. Wipe your feet with a clean and dry towel, making sure to get in between your toes. Dry all the folds of your skin completely. 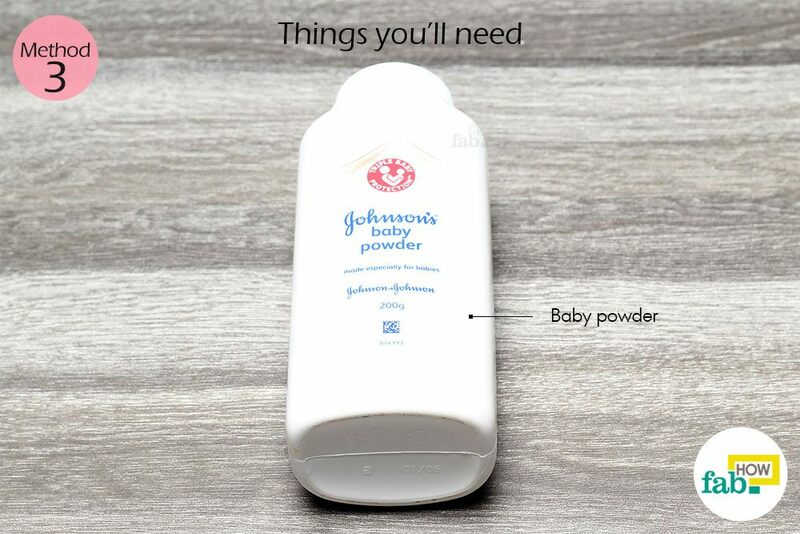 Sprinkle baby powder heavily all over your feet, spreading the powder around with your hands. 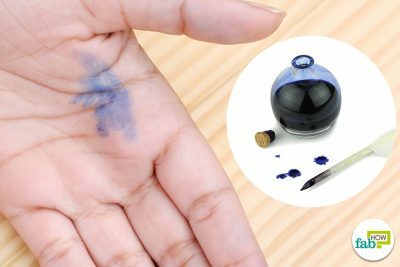 Get the powder in the folds and crevices of the skin. This powder acts as an absorbent against the sweat. No sweat means little chance for bacteria to feed and multiply. It is an effective means to keep your feet dry and stink-free. You may also use any talcum powder or antibacterial powder. 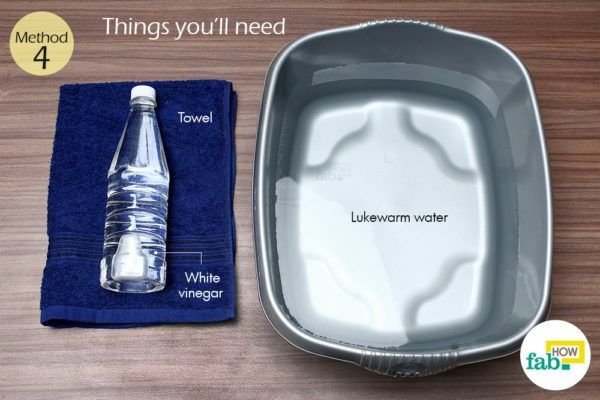 Put about 1 gallon of lukewarm water in a tub. 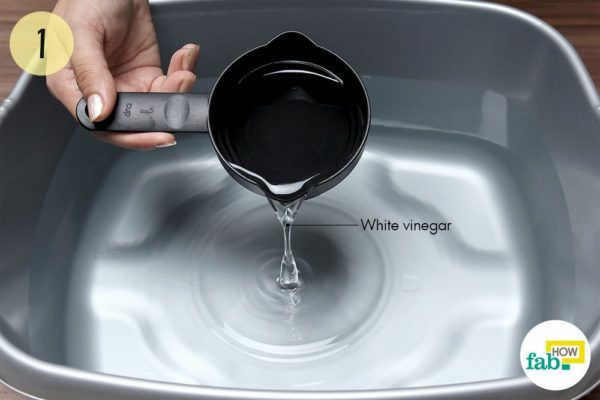 Add 1 cup of white vinegar to it. Vinegar makes the environment of your feet more acidic, which makes it difficult for the bacteria to thrive. By hindering the growth of bacteria, it limits the chances of bad foot odor. You may also use apple cider vinegar as an alternative to white vinegar for this method. Allow your feet to remain in this vinegary soak for about 15 to 20 minutes. Wrap a soft towel around your feet to soak up the dripping water. Dry your feet completely, including the space between your toes. Let your feet stay bare for some time to air them out. Put some tepid water in a tub. 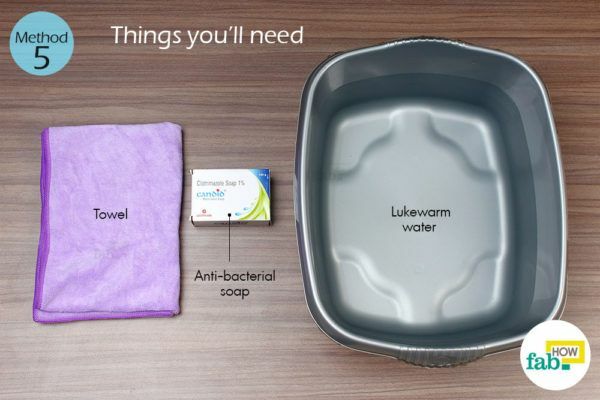 Wet your feet and wash them with an antibacterial soap. You may ask your pharmacist to recommend an over-the-counter antibacterial soap. Scrub your feet thoroughly with the soap, paying special attention to the space between your toes. Optionally, you may also use a foot brush and a pumice stone to deep clean your feet. Afterwards, rinse your feet. You may also do this while you’re taking a shower. Thoroughly dry your feet with a clean towel. Dry the space between your toes as well. If the feet are left damp, the bacteria can easily multiply in a matter of a few hours. Pour 1 quart of lukewarm water into a tub. Add 1 tablespoon of baking soda to it. 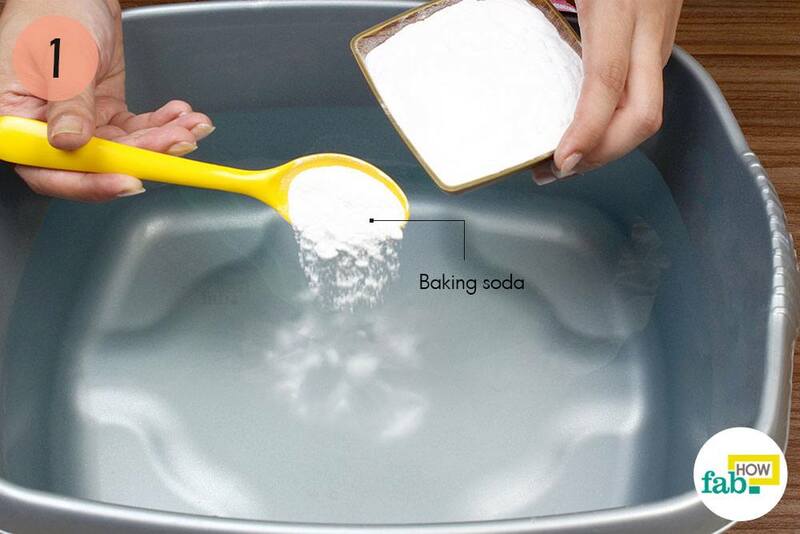 Baking soda is both deodorizing and antimicrobial. Hence, it provides dual benefits for your stinky feet. Optionally, you may also squirt a little fresh juice from a lemon to give your foot bath a fresh feel. 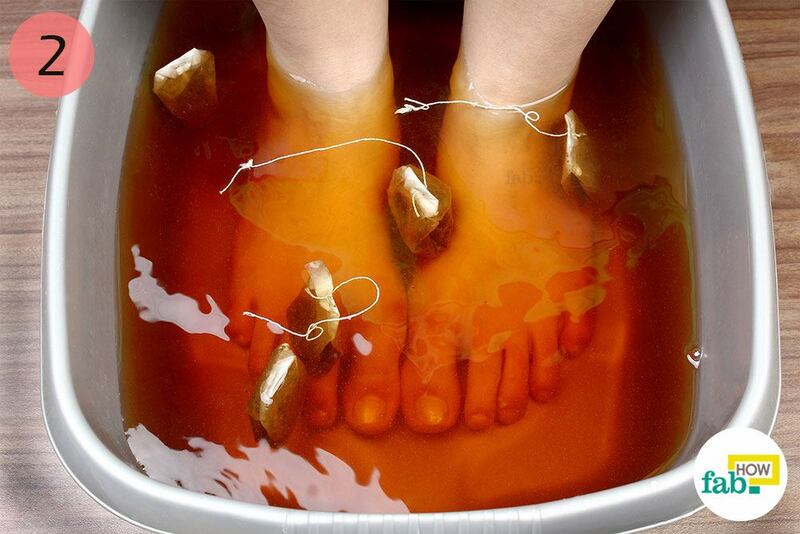 Soak your feet in the baking soda foot bath for 15 to 20 minutes. 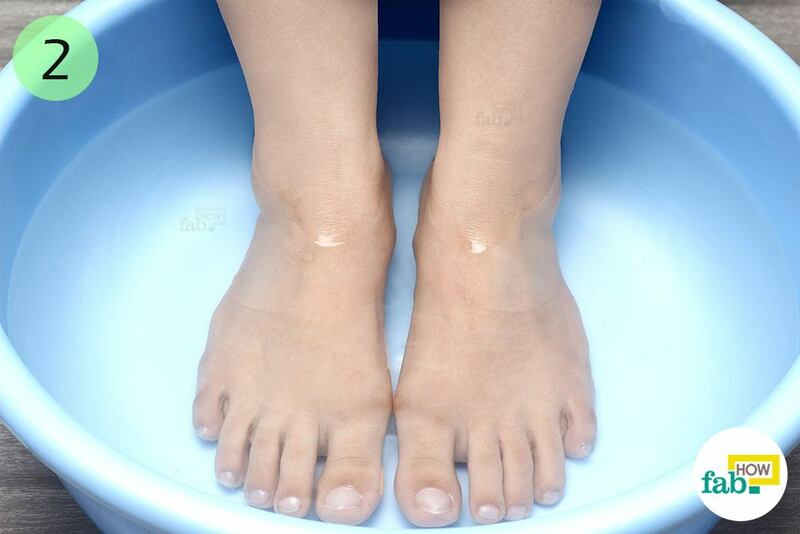 If you have cracked heels, a baking soda foot soak will also help you with those. 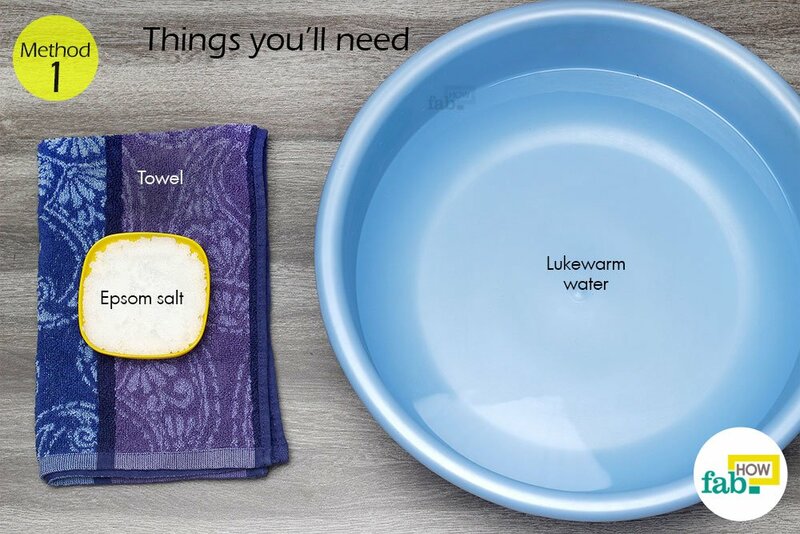 Wipe your feet dry with a towel. Dry the space between your toes and let your feet stay bare for some time. 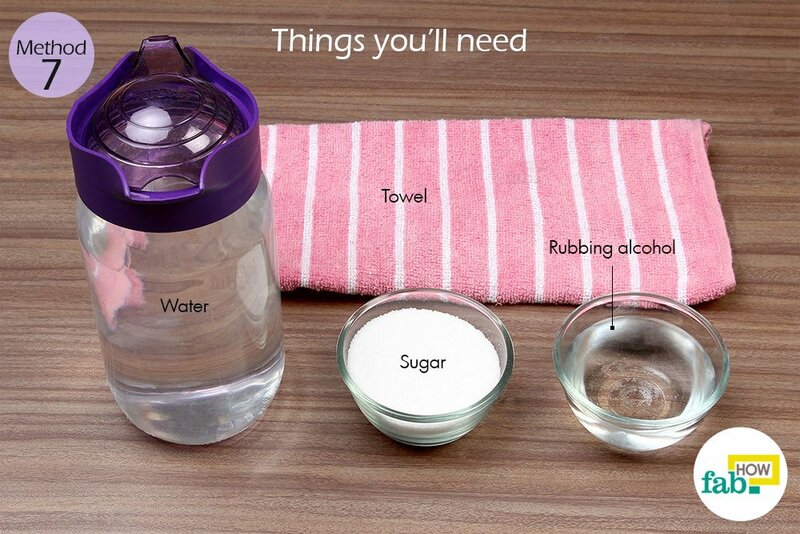 Add 2 tablespoons of rubbing alcohol (isopropyl alcohol) to ½ cup of water. Rubbing alcohol is very effective in killing bacteria. 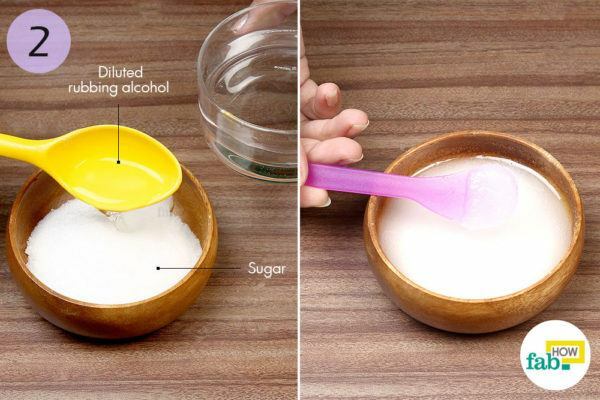 Put 6 tablespoons of sugar in a bowl. Add the diluted rubbing alcohol to the sugar to form a paste. The paste should be a spreadable consistency, neither too thick nor too runny. Your sugar scrub is ready. The quantity of the scrub may be increased or decreased depending on your needs. Apply the sugar scrub on your feet with your hands. Lightly scrub your feet with the scrub and let it sit for 10 to 25 minutes. This sugar scrub exfoliates the dead skin on your feet where the bacteria thrive. With the removal of the outer layer of dead skin, the bacteria and the foul stench gets removed as well. Also, the rubbing alcohol sanitizes your feet. Rinse the sugar scrub off your feet with lukewarm water. Pat your feet dry with a towel, along with the space between your toes. If the sugar scrub feels a little drying to your skin, you may apply a light moisturizer on your feet. 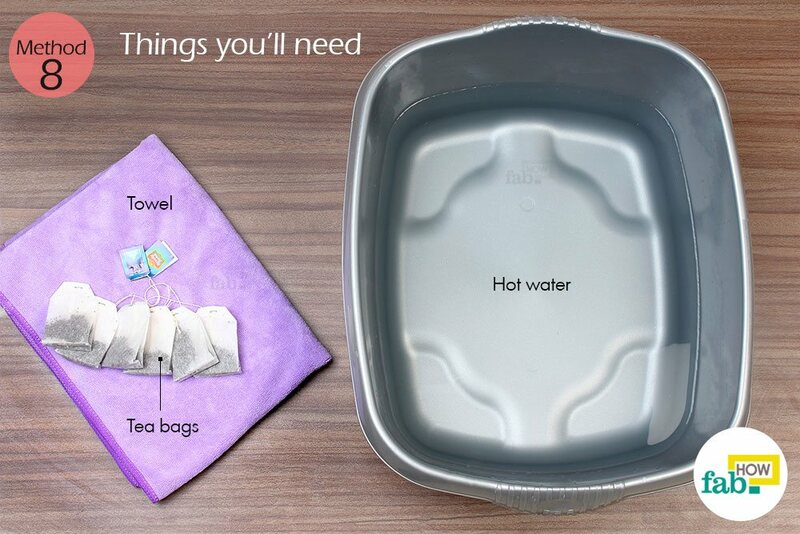 Fill a tub halfway with hot water. Add about 5 tea bags to the water. Tea possesses astringent properties, which means that it can make your sweat glands contract to limit the amount of sweat produced. Tea also has high levels of tannic acid. This helps create an acidic environment in which the bacteria cannot thrive. Allow the tea to steep in the hot water for 10 to 15 minutes. The water will also cool down during this time. Test the temperature of the water and dip your feet into the tea. Soak your feet in it for about 15 to 20 minutes. 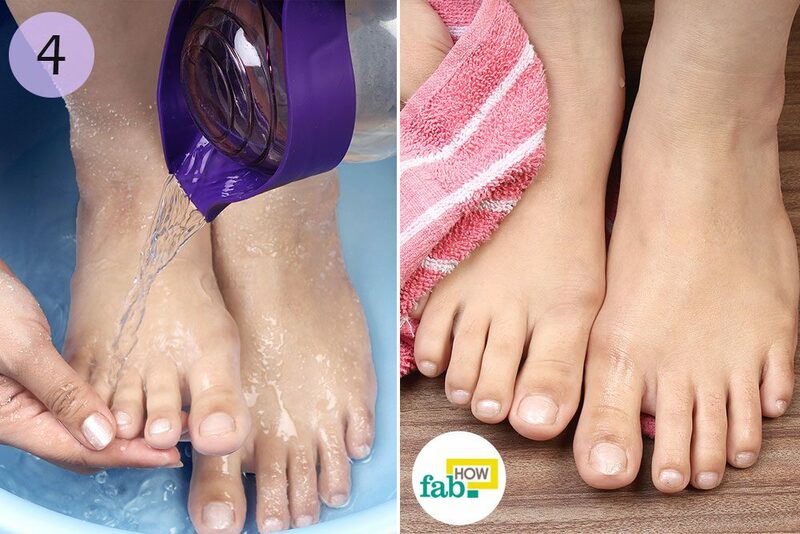 Pat your feet dry with a clean towel. While you soak your feet, relax in the meantime. Light some aromatic candles. You may listen to some music, read a good book or paint your nails to enhance your foot bath experience. Always wear socks with shoes, unless you opt for open shoes. This minimizes the chances of sweating from the feet. 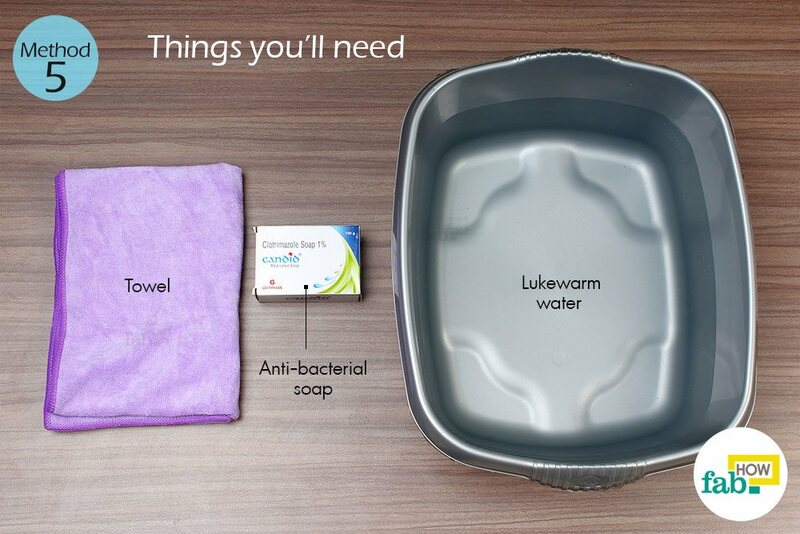 Wear clean socks daily to minimize the bacteria concentration. Socks should be made from a breathable fabric like wool or cotton, as opposed to nylon or other synthetic fabrics. This will allow your feet to breathe, resulting in less sweat. Alternate between your pairs of shoes, thus giving them time to dry out completely before you wear them again. Wear leather or canvas shoes, which are more breathable. Hand sanitizers and antiperspirants can be effectively used on your feet to sanitize and deodorize them in a pinch. Eliminate strong-flavored foods like garlic, scallions or peppers from your diet. The strong aroma of these foods translates into a strong stench on your feet. I spray my feet and shoes (let shoes dry over night) with Bragg’s apple cider vinegar. Odor eliminated. It’s the easiest and best instant solution for me. I also mix ACV with lavender oil for an amazing natural under arm deodorant.